Development from a single cell to a multicellular organism requires a dynamic interaction of signal transduction networks. The continuous exchange of information between cells through both contact and diffusible molecules influences gene expression and cell behavior. Our research focuses on cell-cell signaling events that lead to intracellular calcium release. We integrate in vivo image analysis coupled with molecular-genetic tools to elucidate the role of calcium-dependent signaling networks critical in developmental processes such as body plan formation and organogenesis in the zebrafish. 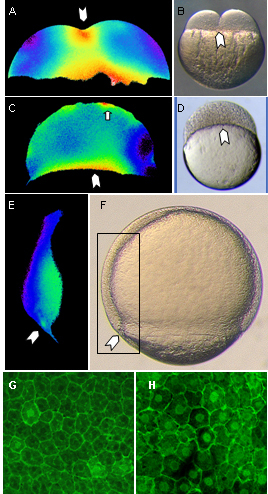 The zebrafish (danio rerio) model system for vertebrate developmental biology has many attributes including genetics, rapid development and translucent embryos. We defined a class of Wnt signaling ligands that modulate intracellular calcium release and are investigating the mechanisms by which this Wnt/calcium class mediates its biological effect on the developing embryo. In zebrafish, the Wnt-5 product is maternally required and loss of Wnt-5 of function results in decreased activity of calcium-dependent regulatory pathways and as a consequence, increased β-catenin signaling. Later-stage calcium manipulation results in increased nuclear β-catenin and perturbation of organ laterality and vascularization. As inappropriate Wnt signaling has been associated with a high frequency of tumors, we are also investigating spontaneous tumor formation in genetic backgrounds that disrupt the function of Wnt/calcium class ligands. Additionally, we have determined that the calcium release requires G-protein signaling. To identify potential intracellular regulators of calcium release dynamics, we are characterizing members of the regulators of G-protein signaling protein family. We have cloned and characterized a few members of the RGS family and find they have essential roles in sensory neuron and somite patterning. Due to the remarkable conservation of developmental processes and mechanisms among vertebrates, we also use zebrafish as a model for human disease and test candidate genes. This page was last updated on Thursday, January 25, 2018 - 11:24am. Please contact us at biology@uiowa.edu or 319-335-1050 if you need further information.